I’ve recently reviewed Moom and Divvy, and I’ve previously covered Cinch, TwoUp and SizeUp, MercuryMover, Zooom, MondoMouse, and Fiwi. Today’s window-moving Gem is Arrange, which combines popular features from several of these other utilities in a single package. With Arrange running, and the window you want to move or resize active, just click Arrange’s systemwide menu-bar icon or press its main keyboard shortcut. In the middle of the screen appears a grid of pre-defined window layouts—click one and the selected window is resized and repositioned to match that layout. Fourteen of these sixteen presets represent specific window sizes and positions: quarter-screen-size in the upper-left corner, half-size on the left, and so on. The other two let you zoom the window to fill the entire screen or center the window at its current size, respectively. As you move the cursor over each preset, Arrange displays a full-size preview—a transparent-blue overlay—that indicates what that preset will do to the selected window. This preview is quite useful; unfortunately, you can’t change the highlight color if, for example, it doesn’t show up well against your chosen desktop image or if you have difficulty with blue contrast. Another minor complaint I have here is that I'd like the presets display to better indicate which part of the screen your window will occupy for a given preset. It’s easy enough to figure this out for screen-corner layouts, but when a preset’s icon is simply a rectangle split in two halfs, you have to use the icon’s position in the grid to deduce which section represents the resulting window position. For example, of the four half-screen layouts, the one at the top of the grid corresponds to a window resized to fill the top half of the screen, the one on the right corresponds to a window resized to fill the right-hand half of the screen, and so on. (Each preset's color is designed to help here: light-blue icons represent layouts with the window in a corner of the screen, orange icons represent half-screen layouts, red icons represent one-third-screen layouts, and so on. But there are so many colors that this color-coding system ends up being just as confusing as it is helpful. In fact, I ended up using Arrange's settings screen to change all the preset icons to a single, more-subtle color.) A better approach, in my opinion, would be for all the preset icons to be the same color, with the “window” in each represented by a second color. If you find yourself frequently using particular layouts, you can access them instantly using keyboard shortcuts—each preset has its own customizable shortcut. These features alone would likely be enough for many people, but Arrange also gives you a Divvy-like feature for custom window positions and sizes. Using this option, activating Arrange brings up a grid representing your display. (If you’ve got multiple displays, you see a grid for each, with the grids arranged to match your actual display configuration.) Each grid is divided into rows and columns—four, five, six, or eight of each, depending on your settings—and you simply click and drag across these boxes to choose your desired window size and position. When you release the mouse or trackpad button, the active window is resized and moved to match. One drawback here is that if you prefer to use the mouse or trackpad to activate Arrange, you must choose, in Arrange’s settings, between the presets approach and the “free-form” option—clicking the Arrange icon in the menu bar can bring up only one overlay or the other. (It would be great if you could choose one approach as your default, but Option-click the menu-bar icon to get the other.) However, if you’re a keyboard jockey, you can configure separate keyboard shortcuts for each mode. 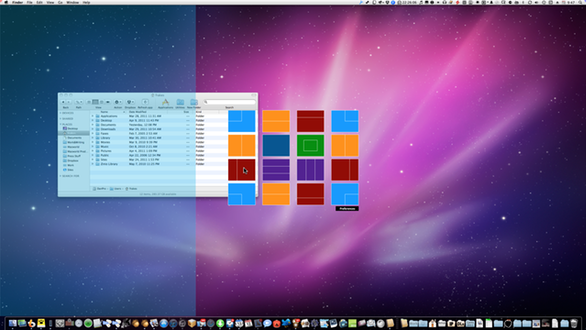 Finally, Arrange includes an additional window-arranging feature similar to one I liked in Cinch. Drag any window against the left-hand edge of the screen and let go, and the window is resized to fill that half of the screen; drag a window against the right-hand edge of the screen to resize it to fill the right half. (If you’ve got a multiple-display setup, you can’t drag a window against the edge joining the two screens, so you’ll need to use the standard resizing feature to place windows against that edge.) Similarly, you can make a window completely fill the screen by dragging it against the top of the screen and letting go, and you can quickly position the window—at its current size—in the middle of the screen by dragging it against the bottom edge. (With each of these features, you get the transparent-blue preview of the window’s target size and position.) This is a great Fittsian option that many people will find easier for basic window configurations. If you like this window-dragging approach, you can enable corner zones, as well. With this setting active, dragging a window into any corner of your screen—with similar caveats for the corners between two displays in a multi-display setup—results in a quarter-screen-size window anchored in that corner. Although Arrange includes some of the best features from several other utilities, it doesn’t include all the options for each. For example, unlike Moom and Cinch, Arrange doesn’t include an Undo command or action, so once you’ve used Arrange to move or resize a window, you can’t restore it to its original size or position. (The one exception is when you use Arrange’s “zone” actions—dragging a window against an edge or corner of the display. If you later drag the window away from that edge or corner, the window is restored to its original size, but not position.) Unlike Divvy, you don’t get the free-form grid on each connected display. Unlike Moom, MondoMouse, and Zooom, you can’t work with a window unless it’s active, so you won’t be able to arrange background windows without bringing each to the front. And unlike Mercury Mover, you can't configure favorite sizes and locations for easy recall. But if you’ve been having a difficult time choosing between several of the other window-management tools I’ve covered, Arrange may be the answer. It gives you multiple options for resizing and positioning your windows, letting you choose whichever works best for a given situation.